No mere gaming chair, the interplay of top grain leather and precision manufacturing is what drives the icon forwards. That’s why we rely on supple and luxurious leather and an intelligent blend of perforation and diamond pattern stitching across the contact are to maximize comfort and breathability, allowing you to stay ahead of the competition without breaking a sweat. -Whether you use EwinRacing chair to play your favorite video games, drink coffee, or watch movies, just pull the lever, lean back and relax. 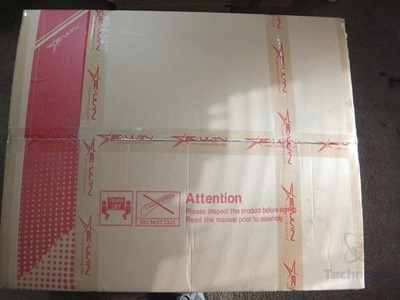 The E-Win Racing Champion series chair ships in a large and heavy box. Fedex said it weighed in at just over 58lbs, the box is brown with red and the E-Win branding on it. Inside you’ll find all of the parts of the chair packaged very well and individually wrapped for protection and in layers as well. I love the color black so this chair is perfect for me, black just matches everything and looks really good. This chair though does have a distinctive pattern to it on the seat back and seat, it’s a diamond pattern and if you look closely there are holes in it for breathability. The chair is made from PU Leather which is leather made from actual hide but it’s finished with a polyurethane coating and texture. The chair is also made from real top grain leather and you can see and feel the difference and transitions in the chair. 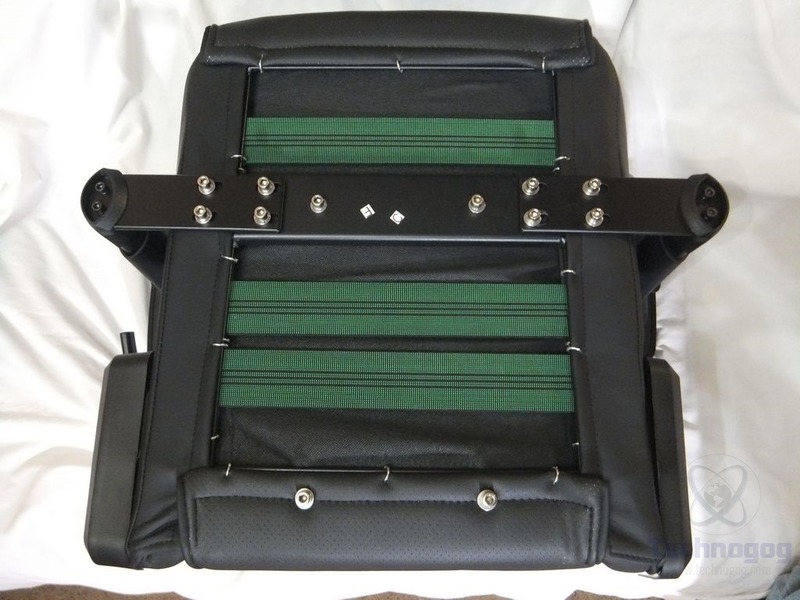 The back and sides of the chair are the PU leather but the main parts where you lean and sit are the real leather making it much more comfortable. 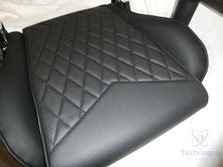 All of the diamond pattern and border is the leather essentially, it’s very soft and supple. Just so you know it’s not a complaint about the PU leather at all, some people actually prefer it as it’s more durable and easier to clean, but I’m a bit old I guess you could say and I love the look and feel of leather. The chair has two pillow for extra comfort, one at the head and one at the bottom for your lower back or lumbar area. 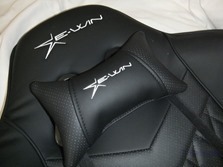 The pillows are soft and comfortable but yet firm as well. The pillows are also made of a combination and leather and PU leather, you can see the differences in the material very easily. Both of the pillows are attached to the chair with elastic straps and they can be adjusted easily or just removed altogether if you want. The back of the chair has the E-Win logo there at the top and you can see the elastic straps and plastic clips so you can remove them if you want. 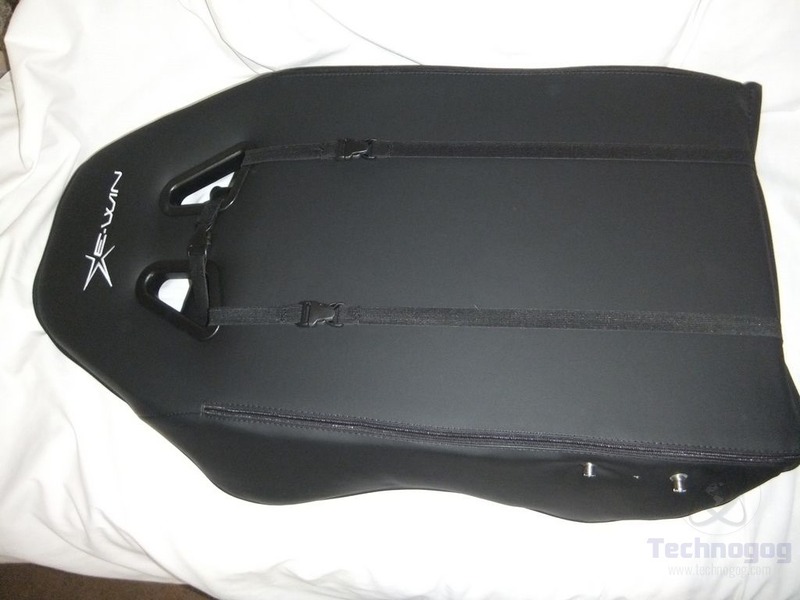 The Hero series chair I reviewed a bit ago has both pillows attached on one set of straps but this chair has separate straps for both pillows which I like much better than the single strap system. On the right and left of the chair back at the bottom you’ll see two metal bolts, this is where the chair back attached to the seat. 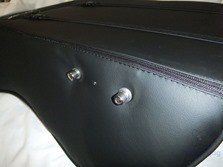 The seat has armrests on each side of it of course and sides that flare up from the main seat. 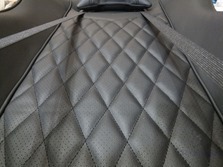 The leather and diamond pattern continues to the seat so you’re leaning on the leather with your back and also sitting on it. The seat is also a combination of the PU and leather, the seat itself is leather while the flares on the sides are the PU material. 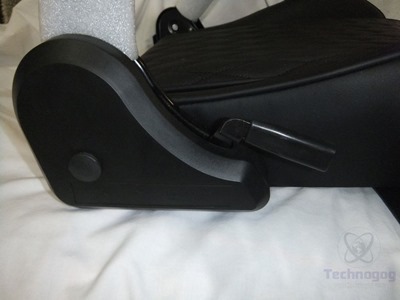 The armrests are covered in the same PU material as the outside of the chair but they’re very adjustable. There is also padding under the covering but it’s fairly stiff with an almost solid feel really. 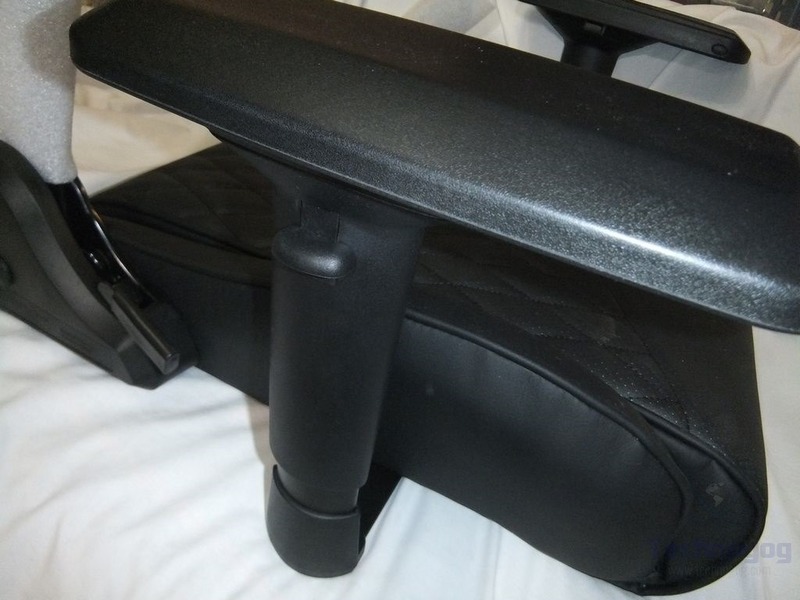 There are two button on the inside edge of the arm rest. 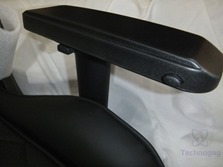 The front button is lock/unlock to slide the armrest forward and back. The button on the inside center is so you can slide the armrest right and left. 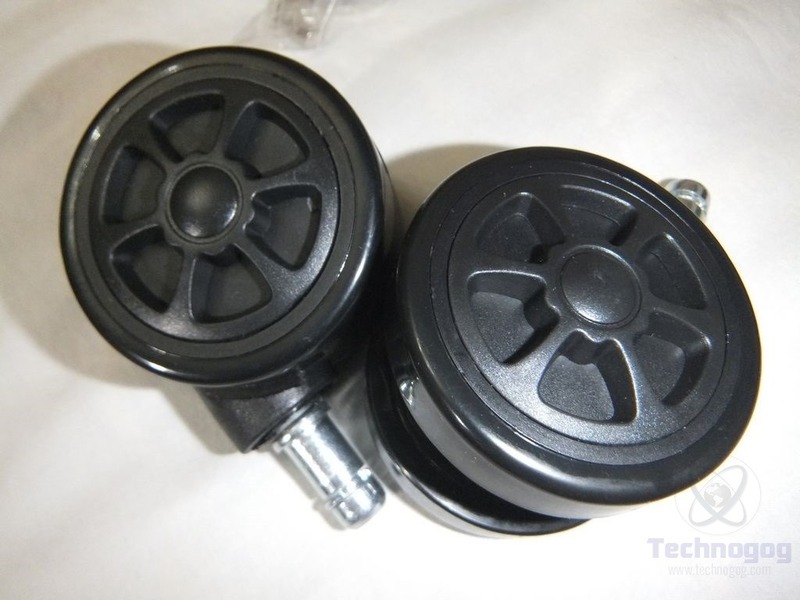 The whole armrest can also rotate clockwise and counterclockwise but there is no button for that, it just turns but locks into place. 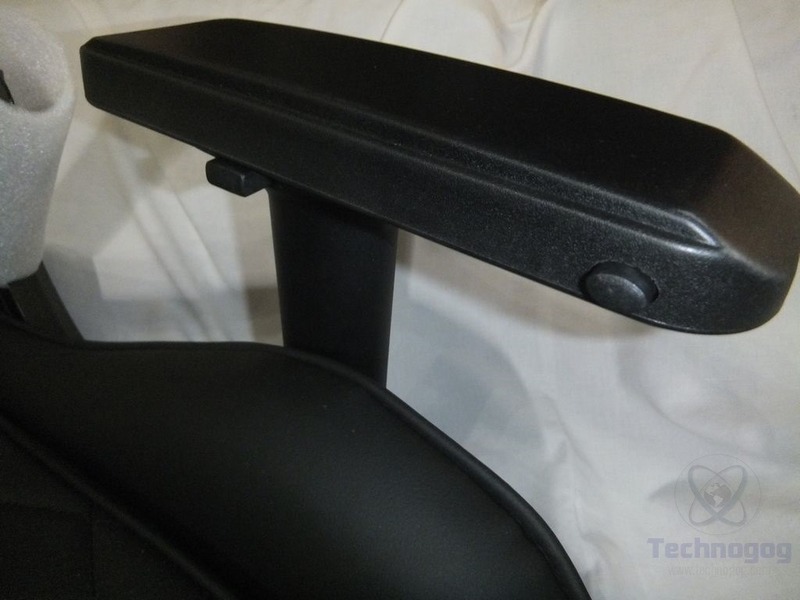 On the outside of the armrest is a lever or switch you pull up on to raise and lower the whole armrest, so as you can see it’s very adjustable, which is something I really like about this chair. On the right side at the bottom edge of the outside of the seat is the lever to unlock the tilt function so the seat back can tilt backwards and forwards. The seat back can be tilted from 85-155 degrees which is almost flat like lying down. If you do that you’ll want to make sure the seat is locked or else. 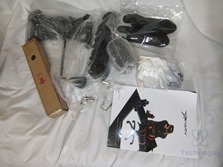 Inside of the larger box was a smaller box that holds all of the accessories and parts to put the chair together. The first thing you should notice is the lack of screws in the package, without screws how do you put the chair together? 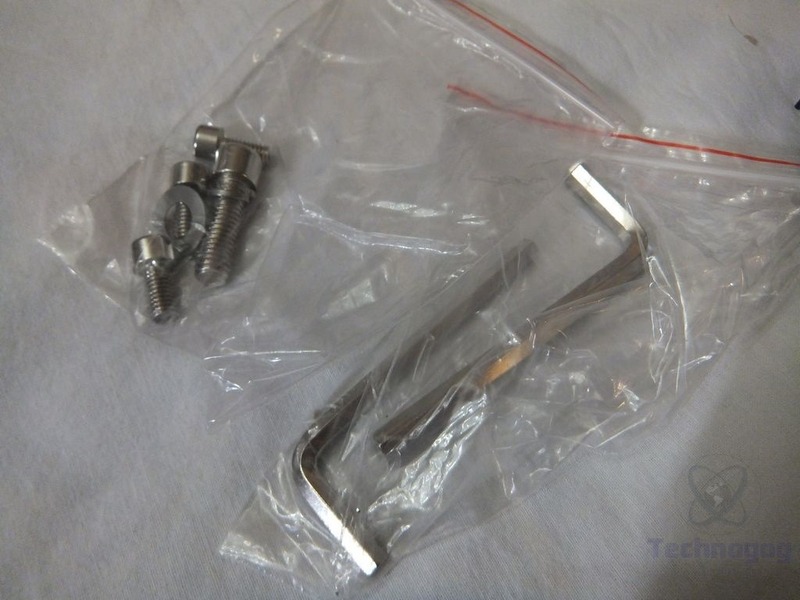 Well E-Win has made assembly easy for you, the screws are already in the chair in their proper places and you take them out as you’re assembling it and then put them right back in so there’s no guesswork as to what screw goes where, I like this system, it makes things much easier and for a faster assembly. The instructions are included but they’re basic, just 15 steps really and you’re done. Also included is a pair of white gloves to keep your chair looking clean while assembling it. They do provide a couple extra screws for you just in case and two hex wrenches that are used for assembly. 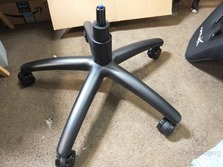 There are five casters or wheels for the chair included and they have a racing or sporty look to them, but they’re well made and seem very sturdy and move or spin freely. On of the things I like about these chairs is they have a sturdy steel frame making it very stable and on the bottom of the seat you can see a part of the frame. 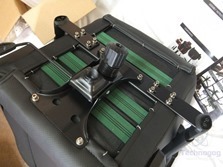 To assemble the chair you attach the back to the seat then attach the base to the bottom of the seat. The base has the lever that sticks out for lifting the chair up and down and for locking and unlocking the tilt of the seat back. 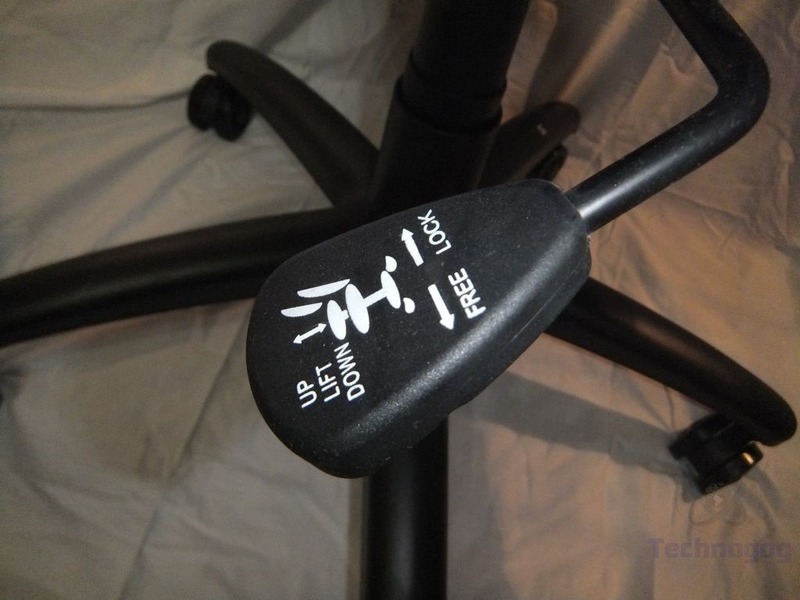 The bottom is also where you’ll find the tension knob for leaning back in the chair. To finish assembly you attach the wheels to the five star base and then insert piston and cover and then set the seat on the piston and you’re done. 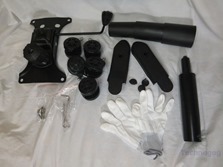 There are some other small details like plastic covers but those are easy, then again the whole chair is easy to assemble. 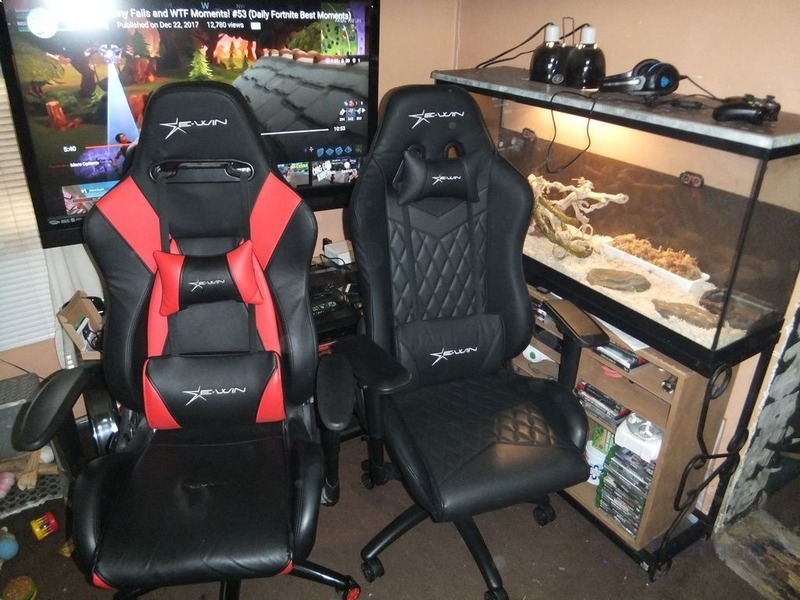 So now I have two E-Win Racing gaming chairs, the Hero Series and the Champion series, so here’s both of them together for comparison. 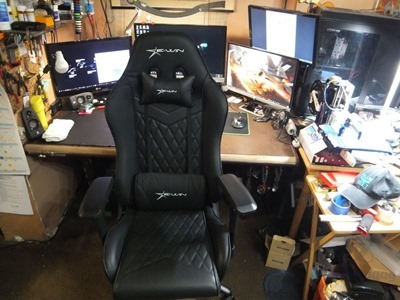 There are some differences in design and I have to say both are comfortable but I really like the leather better of the Champion chair, and I like the more adjustable armrests as well. The leather of the Champion chair is just softer and much more comfortable in my opinion. 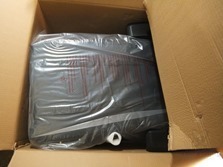 I should mention that I’ve had the Hero series chair for not quite a year now and it’s been used everyday for several hours per day and it still looks like new, so it’s built to last I would think. So here’s the chair assembled and at my desk, and yes I know my workspace area is a mess. 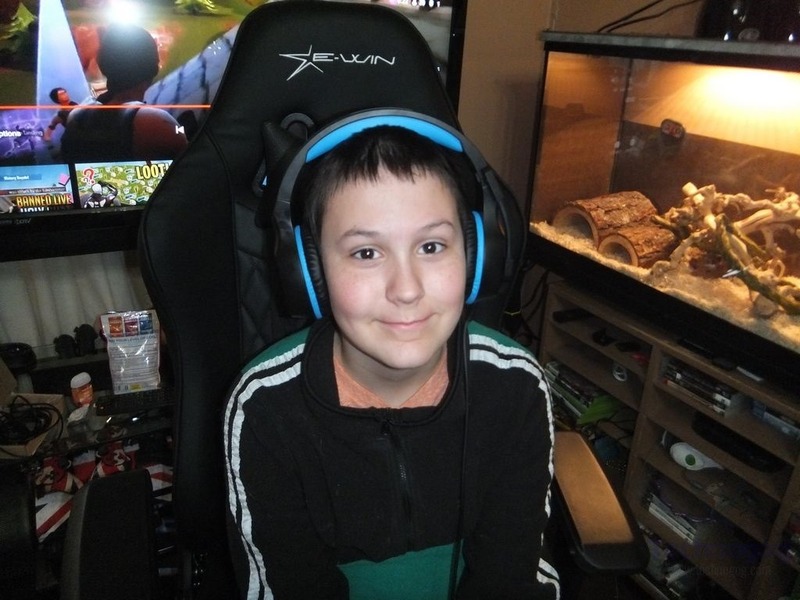 I’ve been using the chair everyday as my main chair for working, gaming, watching videos and just doing whatever at my computer. 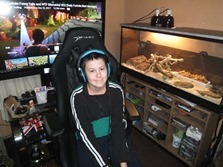 I normally get up about 4:30am when kids are in school and go to bed about 11pm and I spend of lot of that time during the day in a chair and I have to say it’s very comfortable to sit in for long periods of time, I’ve certainly tested it out. In the evenings I like to lean back and relax with my feet up on my desk and watch a movie or TV show and it’s nice to be able to do that in this chair. Originally I didn’t really care for the pillows but I’ve grown to like them, especially the head pillow for watching movies. I’ve learned to like the lumbar pillow as well, I’ve never really used one before but I find it comfortable. 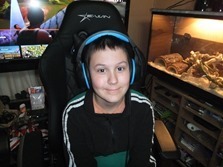 My son wanted to test the chair as he’s been using the other one and he likes this one better as well, but too bad I’m keeping it for myself! 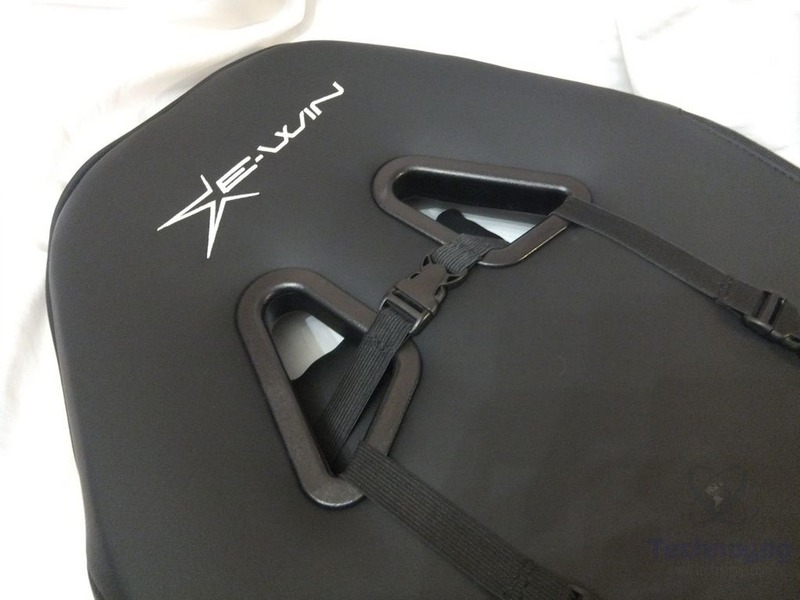 The E-Win Racing Champion series chair is the best chair I’ve owed so far, and I’ve gone through a lot of them over the years. The chair is made from PU leather and real top grain leather and I very much like the looks and feel of it, there’s nothing like real leather for sure. The leather is strategically placed in the chair where most of your body meets the chair. The leather is soft and supple and just very comfortable to sit on for long periods of time. The leather has very tiny holes in it to allow it and you to breathe making you more comfortable for long gaming sessions. 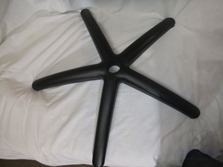 The chair is very easy to assemble, it takes less than 30 minutes really, and that’s if you really take your time. I like the fact that the screws are already in the chair for you so it takes the guesswork out of figuring out what screw goes where. 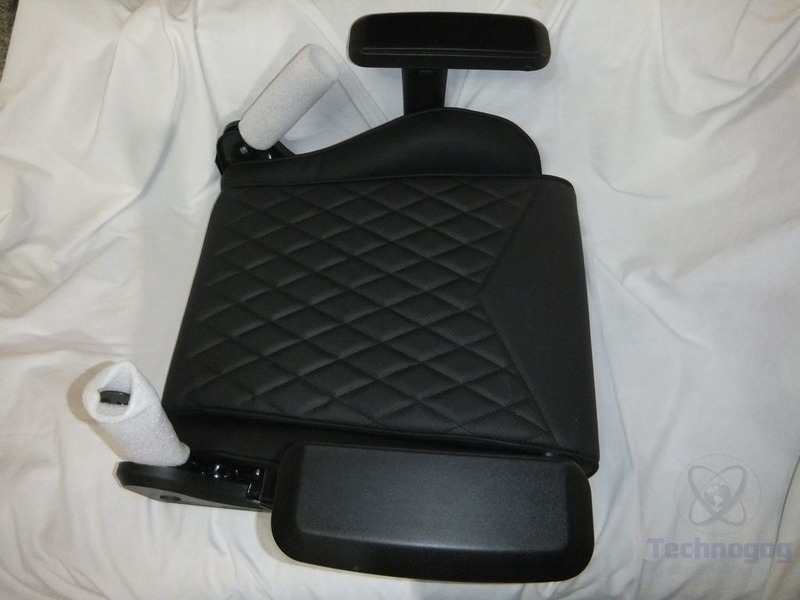 The Champion series chair has plenty of adjustments to make you comfortable know matter how you want to sit or what you’re doing while you’re sitting. One of the main differences between the Hero series and Champion series chairs is the adjustable armrests which do much more than just move up and down, you can position them exactly how you want them and they’ll lock that way. The small pillows are a nice addition for extra added comfort, I really do like them, but I have to say that at first I didn’t, but now I do. 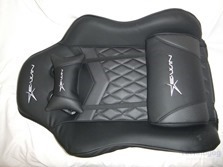 I sit in a chair for many, many hours per day and for me a solid comfortable chair is a must and the E-Win Racing Champion series black chair is very comfortable. The chair is not only comfortable but it’s well made and it looks good too. Some people like the flashy colors of chairs but I much prefer just a solid black, and this chair looks good that’s no doubt about it. 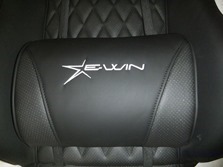 If you’re in the market for a new gaming chair then I can easily recommend the E-Win Racing Champion series to you. Editor’s Note: This is a guest post from https://technogog.com by Kristofer Brozio.